The successful award winners were chosen by a panel that included the Pro Vice Chancellor (Education), the Registrar and the Students' Union. The University’s Outstanding Student Contribution Award (OSCA) recognises those students who not only excel academically, but find the time to engage in other activities from campaigning and fundraising for good causes, working with local charities on a regular basis to even starting a small business. Two of our students, Martin Li and Ragavan Balendran were recognised for their significant contribution and awarded at the students' Degree Congregation ceremony in July. During his time at Warwick, Ragavan Balendran has made a substantial contribution to the welfare of others in the local community. Ragavan has been involved with Warwick Youth Phab, a Leamington based youth club for disabled and non-disabled youths, since his first year at university. As President, his role is to ensure that the club has enough volunteers each week and to run the club by recruiting students and local volunteers. He has also helped raise funds for the charity through contacting local businesses and running fundraising events. The club offers youths the chance to develop new interests and have fun in a supportive environment. The club also gives the parents and guardians some much needed respite from care duties. It has offered students the chance to volunteer in the community and has raised awareness of funding support and other external groups. He has sourced First Aid, Disability Awareness and Safeguarding training so that all volunteers feel confident to undertake their role and can develop within the setting. 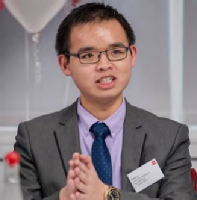 Martin Li has contributed to Warwick through his engagement with multiple societies. At Enactus, he became involved in a social project called BeCEO, where he designed workshops on business and entrepreneurialism for children in under-privileged schools. He was also involved in Warwick Consulting Society/180 Degrees Consulting, where he helped a start-up called GotPolitics which aimed to get youngsters to be more politically involved by looking at their finances, marketing, business strategies and potential school or university ties. He has written for the Warwick Economics Society and Warwick Finance Societies magazines, delivering articles and talks. And as Economics Student Mentor he mentored over 25 first-year students and volunteered his time as a maths tutor with Warwick Volunteers and Teach First. Martin is also engaged with Warwick Sport. He is an active tennis and badminton member is a qualified football referee, helping out by officiating the Warwick football league matches every Wednesday and Saturday. This has led to him volunteering in the local community by officiating in external county matches, Coventry City Academy, or cup finals at Leamington FC. Martin deeply cares about helping others and has an impressive track record of engaging with the wider community at local and national level.